Whenever Zack Ajmal posts a new update to the Harappa Ancestry Project he appends some data to his ethnic database. This sends me to Wikipedia, because how many people are supposed to know what a “Muslim Rawther” means? Well, if you are a Muslim Rawther, and perhaps from Southern India, you would. 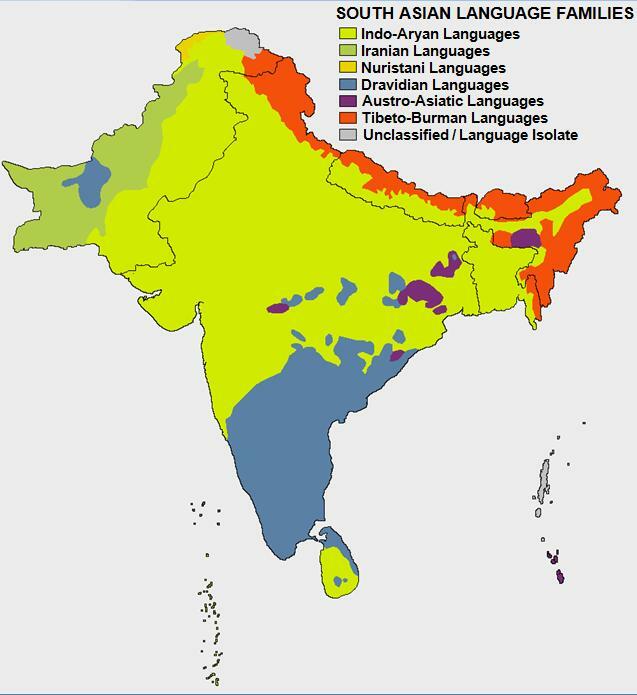 But South Asian ethno-linguistic categories and hierarchies are notoriously Byzantine, and I have difficulty making sense of them. This isn’t too surprising in my case, as my family’s background is relatively mixed in the very recent past (e.g., Hindus and Muslims, and people of various caste backgrounds), so we’re not the sort who can go at length about our pure ancestry and all that stuff. Unfortunately, Wikipedia isn’t always useful, because the people editing the entries on particular South Asian ethnic groups are often people from those ethnic groups, so you get a lot of extraneous information, and a particular slant on how awesome and high achieving the group (also, sometimes there’s funny stuff about how notoriously good looking that particular caste!). On occasion there are other sources which are informative. For example, Zack has several individuals from the Tamil Nadar caste. I know a little about this group because 1) I have a friend whose family is Nadar (he’s American, so saying he’s an American Nadar is pretty worthless), 2) The New York Times profiled the group last fall. Viśvákarma is the term used in India for a caste of priests, engineers, architects, sculptors, temple builders and artists. The term is applied to five sub-castes; blacksmiths, carpenters, coppersmiths, goldsmiths and sculptors.They connect themselves as Pancha janas of vedic period [Rathakara, Karmakara, Thakshaka, Kumbhakara,and NishadaSthapathies] and worshiping various forms of Viswakarma, i.e., Twostar, Daksha prajapathy, Takshaka and Maya and Rhibhus etc. Vishwakarma Brahmins are also called Rathakara Brahmins, and the Rathakara mentioned in the Rigveda (1.6.32) indicates high status and is associated with the placing of the holy sacrificial fire in the Yajna kunda…According to the Srautasutras, the Rathakara (Chariot-maker) is entitled to perform all the sacrifices….In many sacrifices, like the Rajasuya, the Rathakara played a role as recipient of the offerings (ratninaḥ)…. First, I don’t know what a lot of this means. For example, “many sacrifices, like the Rajasuya….” makes no impression on me, as I don’t know what Rajasuya is supposed to be. But the salient point here is that the Vishwakarma are making some assertion to a relationship with Brahmins. This, I can understand. Many non-Brahmin groups in South Asia want to associate with Brahmins, because Brahmins are high status and socially superior. I assume most of the time this is made up, how many fallen Brahmins can there be exactly? It’s kind of like claiming descent from Muhammad among Muslims, or being descended from a particular lecherous and promiscuous king among the poor of Europe. But after months of the Harappa Ancestry Project you can shift your assessment of the probabilities based on the genetics alone. 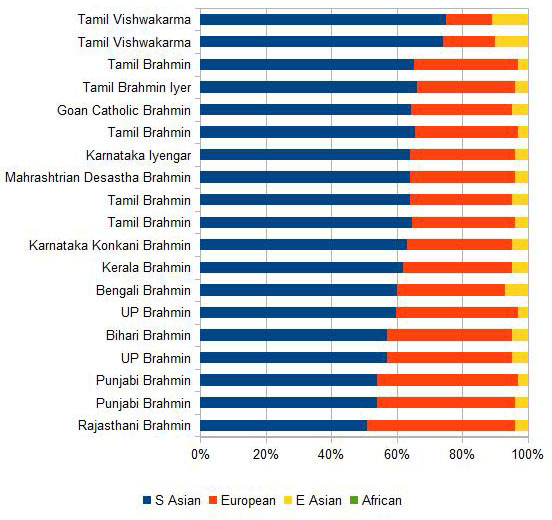 South Indian Brahmins are genetically distinctive consistently from other non-Brahmin South Indians. So how would I go about exploring the veracity of the Vishwakarma’s claims? First, I am looking at K = 4. So the data set has four ancestral populations: South Asians, Europeans, East Asians, and Africans. These are hypothetical abstractions, so focus on the relative relationships across individuals and groups, not on the absolute quanta. I took Zack’s ADMIXTURE results, ethnic labels, and added a few categories myself. You can see the CSV here. Basically I took the ones with caste identification and partitioned them into Brahmin vs. non-Brahmin. Note that the non-Brahmin categories includes groups of all caste ranks. It’s socially heterogeneous. I also added a geographical label. NW = Pakistan, and the northwestern third of India. NE = Bangladesh and the northeastern third of India (Bihar is in the northeast here). S is south, for the four Dravidian dominated states. And C, central, includes Mahrashtra, Gujarat, etc. First, let’s look at all the Brahmins and the two Vishwakarma. I sorted by South Asian ancestry. The Vishwakarma are outliers among the Brahmins. You can see a discontinuity. They’re like other non-Brahmin South Indians. No discontinuity. I can’t attest to the spiritual Brahmanitude of the Vishwakarma, but I’d say that they’re probably asserting Brahmin associations to elevate their status vis-a-vis other castes. Now let’s look at the all the Harappa samples. I will sort first by region, and then by South Asian ancestry. A few notes. Jatts are originally the freehold peasant cultivators of Punjab I think. They think they’re pretty awesome! Sourastrians are transplants from Gujarat to Tamil Nadu in the South. They’ve maintained their Indo-Aryan dialect. The two Bengalis with a lot of East Asian ancestry are my parents. 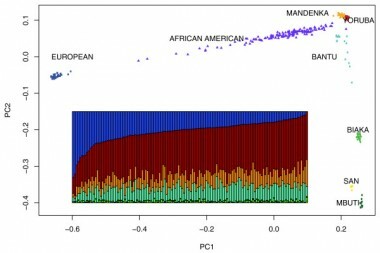 There is a pretty fit here to a two parameter model of predicting South Asian ancestral quanta: geography & caste. 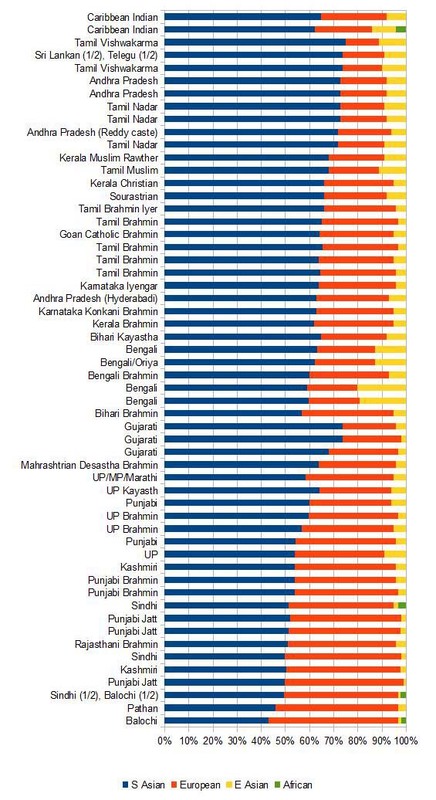 Where this breaks down the most seems to be in the far northwest, where the Brahmins don’t seem to be that much less South Asian than non-Brahmins, and in fact, perhaps more South Asian than the peasant Jatts. Finally, the origins of Caribbean Indians is generally presumed to be among the peasants of the northeastern half of the Indo-Gangetic plain, going by the historical sources and the persistence of Bhojpuri in Trinidad and Guyana. This looks about right. 13 Comments to "Genetics as the Myth Buster: Indian Edition"
Mostly northeastern Indo-Gangetic plain (though, of course, everyone claims a Kashmiri ancestor*) but with a non-trivial south Indian minority. Most ships (sorry, I don’t have numbers) are supposed to have sailed from Calcutta, but there were also ships that left Madras and “Madrassi” remains an insult for someone dark. In one of his books, VS Naipaul mentioned that the Indians who settled around Port of Spain (St James, Boissiere Village) were disproportionately Tamil. *Sort of like the way every American seems to descend from a “Cherokee princess”. While sometimes this was true – Gokool Meah, as a famous example – often a “Kashmiri” great-grandparent was actually a Scottish overseer. Makes me wonder about my own allegedly Kashmiri great-great-grandfather. It would be very helpful to have some summary that strikes middle ground between the very course grained descriptions based on Indo-European v. Dravidian v. other, or on Brahmin v. non-Brahmin caste v. dalit/tribal, or Hindu v. Muslim v. other on one hand, and the “there are thousands of sub-castes and each village is different” desciption on the other. Is it possible to provide a meaningful explanation of ethnicity diversity in South Asia that looks at dozens or scores of categories, rather than just a few or many hundreds, that would be practical to apply? It would also be very useful to see included in that middle ground distinction a greater sense of what these categories mean in daily life in some sort of narrative context. I realize that this is far more than a blog post of effort. The kind of summary I envision might run to thirty to sixty pages with a few inset illustrations and maps for each group. But, one would think that this level of detail has been undertaken sometime by someone in a civilization of more than a billion people that has been in regular contact with the rest of the world for thousands of years, and perhaps even on the net given the large number of South Asian, English speaking computer wizzes that there are in the world. Only tangentially related to the subject of your post but if the author of the wikipedia article or his source had read the shrauta sutras (auxiliary texts to the Vedas concerning ritual.) more carefully he would have known the Rathakara is mentioned as the canonical example of a caste that is entitle to participate in some parts of the Vedic sacrifices despite not being Brahmanas at all. What would be interesting to know is if these Tamil Vishwakarmas had any genetic relationship to the Gujarati artisanal castes who also adopt the name Vishwakarma and have similar origin myths, claims to status etc. Do they have some common ancestry and separated at some point in the past or did they just coincidentally find the same scriptural peg to hang their geneological hats on? all such questions can be trivially answered with relative confidence in a few years. Wouldn’t a comparison of y-chromosome haplotypes be more appropriate here? South Indian Brahmins are endogamous, generally speaking, correct? This might account for the differences between the Bishwakarma and Tamil Brahmins in your table. Perhaps the Vishwakarma are descended from a group that has intermarried more with the non-Brahmin population, but still maintained their Brahmin identity because of paternal descent. From the DNA data, Tamil Vishwakarma is identical to Tamil Nadar. Vishwakarma is a Sanskritic word , refers to the artisan god Vishwakarma. It is an attempt by South Indian Dravidian artisan castes to raise their status by Sanskritisation. Similarly the Vanniyars, another Tamil Dravidian backward caste have attempted to Sanskritise themselves by calling themselves Vanniya Kula Kshatriya. Kshatriya being a Sanskrit word for the second ranking caste. 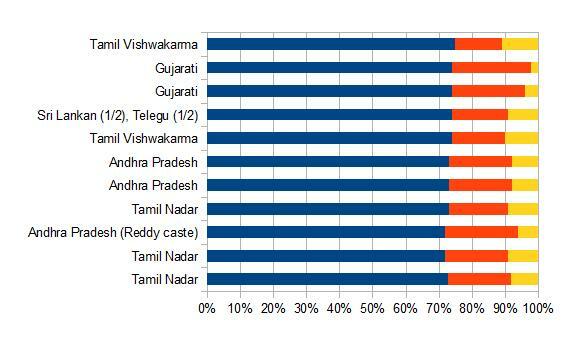 and Gujurati brahmins about 33% R1A and Bengali brahmins 72% R1A. It is interesting that four individuals have some African ancestry, no doubt due to the slave trade. The Carribean individual acquired it from the European slave trade and the Sindhi and Balochi individuals from the Islamic slave trade. But what about the E. Asian component? History and geography can explain its presence in Razib’s parents and in Bengali individuals. According to Reich et al. South Asians can be modeled as a linear combination of ANI and ASI or in this model a linear combination of S. Asian and European. The ASI is quite distinct from E. Asian. Why is there some E. Asian in most individuals? Is this real or is it an artifact of the ADMIXTURE analysis? yes. african shows up in muslims quite often. clear if you look at the pakistanis individual in HGDP. first, reich et al. know that there are other minor elements. that’s why they discard outliers which have these minor elements to a great enough extent. second, i assume that it is noise in most of the cases. but some of the south indian samples (tribes) look way too admixed to be noise. the slave trade probably came from southeast asia too. in sri lanka malays have preserved their cultural identity, just as they have to some extent in south africa (less so), but probably this percolated in parts of south india. we aren’t surprised when we see west asian among kerala christians. we should be less surprised if we see some southeast asian in the tamil country.